Using the HYPACK-supplied hardware, the GPS position from each secondary vessel is broadcast via a Wi-Fi network, making their position and heading data available to the barge computer. Long range antennae options allow for connections up to 2 miles between vessels. The HYPACK SURVEY computer on the barge positions all vessels on the user-defined projection with S-57 maps, GeoTIFs and construction drawings in the background. 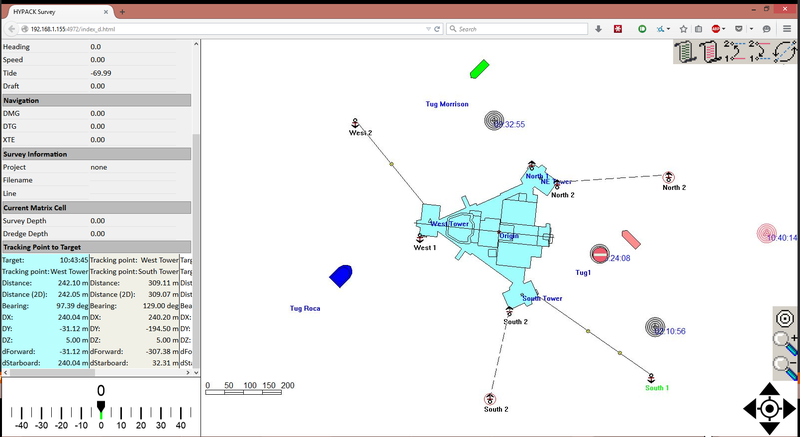 Tugs and remote viewers can then view their own survey screen, using either a web browser or their own copy of HYPACK. Users also get access to HYPACK’s support staff. Using TeamViewer they can log onto your remote computer, check the configuration and offsets and get back to operation.